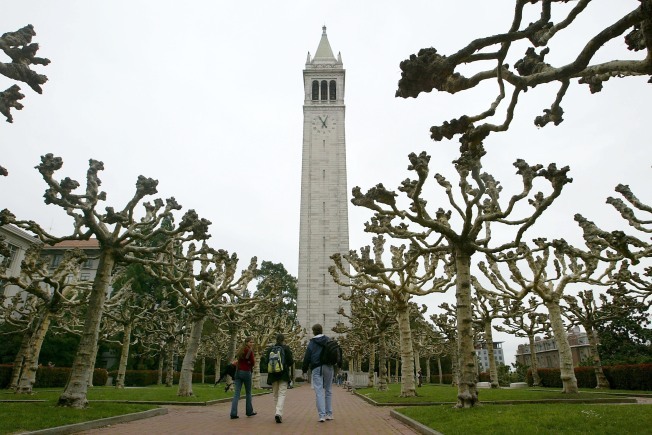 University of California to Launch Free Speech Center in Washington, D.C.
Students walk near Sather Tower on the University of California at Berkeley campus in this file image. The University of California will establish a center in Washington, D.C., to study the changing views on the First Amendment and what free speech means for democracy. UC President Janet Napolitano announced the new center Thursday. She says it comes at a critical moment when campuses nationwide face debates and protests about free speech that have at times turned violent. The center will be based at the UC's Washington D.C. campus and will run a fellowship program for lawyers, journalists, social scientists and others who can spend up to a year researching free speech issues. Napolitano will be chairwoman of the new center along with co-chairs Erwin Chemerinsky, dean of UC Berkeley School of Law and UC Irvine Chancellor Howard Gillman.